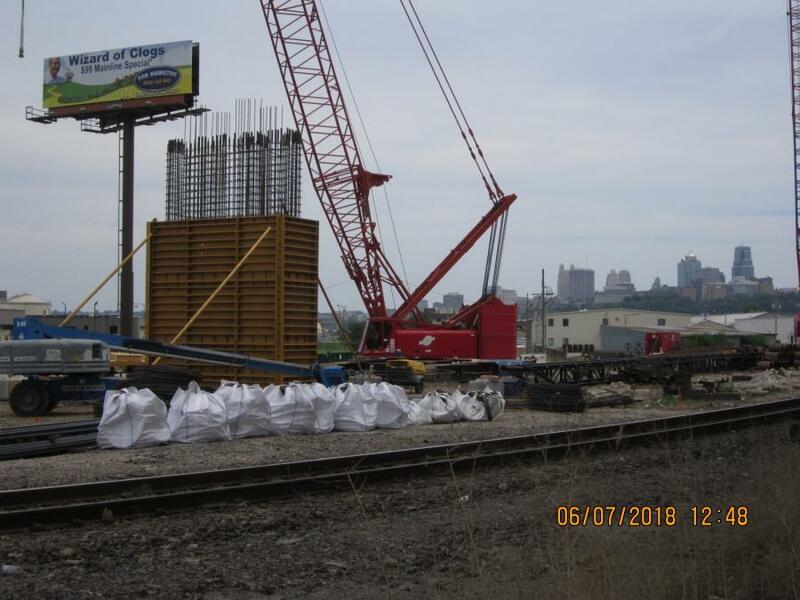 American Bridges is fulfilling a contract from the Kansas Department of Transportation to replace the westbound lanes of the Lewis and Clark Viaduct connecting Kansas City, Kan., with Kansas City, Mo. READ STORY ON PAGE 14. The Kansas Department of Transportation is spending $65 million to replace the aging and deteriorating westbound section of the Lewis and Clark Viaduct on Interstate 70, which links Kansas City, Mo., and Kansas City, Kan. Built in 1962, the viaduct is a key transportation structure that stands in the middle of the Urban4 core area. The job of replacing the three-lane, 0.58-mi. bridge was awarded to the American Bridge Company. Crews began the work in November 2017 and are expected to complete it by the spring of 2020. KDOT rehabilitated the bridge in 1984, but although it has provided good service, the department considers the design to be obsolete because it does not meet modern design standards. The replacement also will provide connections to I-70 to the west, Minnesota Avenue, Washington Boulevard and Fairfax Trafficway. KDOT inspectors and engineers determined that the westbound and eastbound bridges were seriously deteriorating in 2012 and that replacement was the most economical and efficient remedy. The eastbound bridge — a two-level truss structure with four lanes constructed in 1907 — also is targeted for replacement. "It's been on our radar for some time," said Debbi Tanking, KDOT's road design leader, Road Section. "On some of our critical bridges, we do inspections annually, and we started a study in 2012 that looked at our options. This is a big connection point between the cities. The study looked at the whole area to see if we replaced the WB bridge, what the future considerations would be. We had to wait for funding while we prepared our plans for construction." Despite its condition, the old bridge never posed a safety issue. Repairs were costing $1 million plus annually, however, and included the bridge deck, some of the joints and abutments, and elements of the substructure damaged by weathering, such as the piers. "It was a host of issues," said Tanking. "There are two other bridges in the area that were built with the same materials and construction methods, and they are being replaced. If we continued to repair the WB bridge, they would have to put weight restrictions on it and it's important for commercial traffic — we would have been re-routing some of that traffic. It's also important for Fairfax industrial district and many businesses utilize the bridge." The westbound bridge works in tandem with the adjacent I-670 bridge, which ensures neither bridge is congested. The aesthetics of the new bridge were planned in consultation with officials in Kansas City, Kan., to reflect the city's industrial history. The bridge will have a new vertical curve that can allow for a future flyover. KDOT examined the nine major bridges in the greater Kansas City area, and its 2012 report for a long-term reconstruction and upgrade plan agreed that the westbound bridge would be replaced first. The other bridges are being monitored and repaired until the next reconstruction is announced. 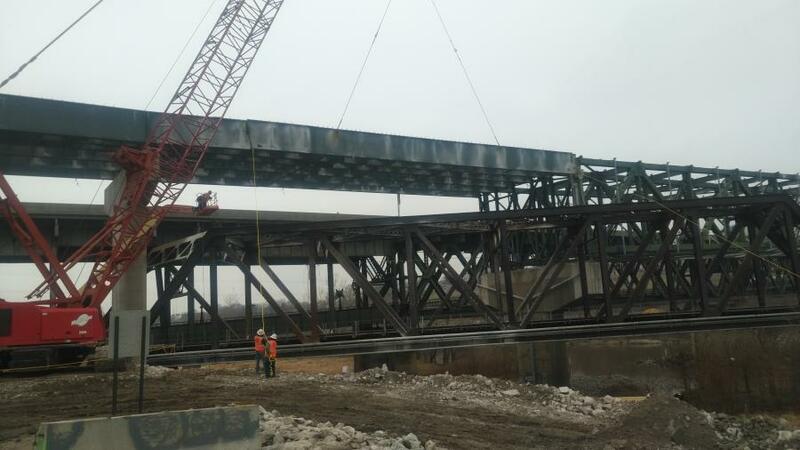 The new 2,980-ft. westbound bridge, which has 20 spans and 19 piers, one of which will be placed in the river, was designed by Burns & McDonnell Engineers, Wilson & Company and Confluence. The current structure had 25,200 cars and trucks crossing it daily (2017), and the new bridge is expected to carry 30,000 per day vehicles by 2037. "The bridge has many important connection points, and it can be circuitous for people to make connections to the industrial area," said Tanking. "We looked at roundabouts and other concepts. We were very careful with the layout and, at the request of businesses in the industrial district, ended up with what we have today. The lifespan of the new bridge will be between 75 and 100 years." The bridge will have concrete and steel beams. The design also accommodates trucks carrying heavy loads. The final bridge design was submitted in July 2017 by Burns & McDonnell. Wilson & Company, employing standard surveying methods, which included land-based LiDAR scanning and mobile mapping, aerial orthophotography, and static and RTK GPS, provided crucial data for the design. With the westbound bridge closed, eastbound and westbound traffic are sharing the eastbound bridge. Detour routes include I-670 westbound, I-35 southbound and, to reach Kansas City, Kan., the Central Avenue exit from I-670. Additional lanes on some streets are being set up and temporary signals will be added to two intersections. KDOT is doing all it can to coordinate the construction with stakeholders such as utilities, railroads and businesses. It also is working with Wheeler Airport and the Federal Aviation Administration to maintain flight schedules. Richard Miller, American Bridge's project manager, said he is satisfied with the progress of his crews, although a major challenge has been planning and coordinating construction around all the activity in the area. "There is a water treatment plant close to the project, and we had to be careful when using drilled shafts and creating vibrations," said Tanking. "We're also behind a levy, adjacent to the airport, and have railways to deal with. There were tight restraints in regards to all the potential conflicts. The ground level of the bridge and the airport are the same, and American Bridge had to bring in cranes for the drilled shafts and to construct the barges to move construction material on the river. The cranes were penetrating the airspace and the airport had to be informed about what we were doing and agree to a crane height that would work for them." Environmental restrictions included restricting work so as not to interfere with fish spawning periods. Additionally, there is a bike path beneath the bridge, many people use this section of the river for kayaking and boating, and the area is part of a well-used state park. "We had to be very cognizant of these activities in regards to the demolition and removal of the pieces from the water so that we could re-open the river for the outdoor community," said Tanking. "They wanted the new bridge as much as we do." 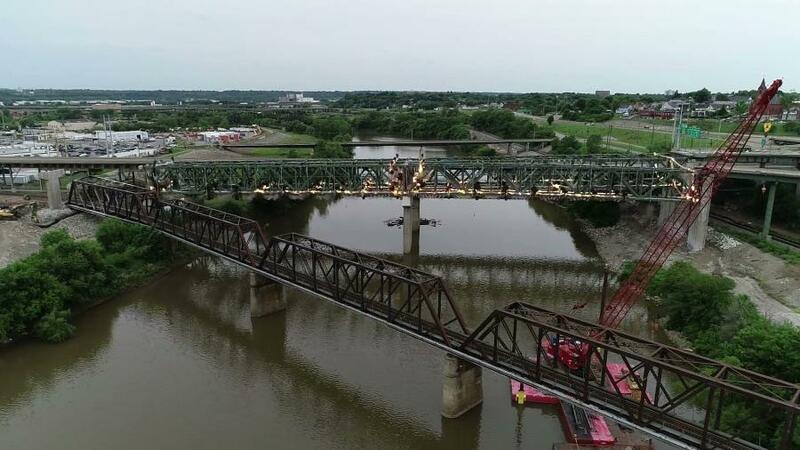 The work site is tight due to the nearby businesses and parking lots, but American Bridge established a laydown yard to assist with work and built a trestle across the river to give crews access to the barges, which deliver materials as needed. "American Bridge has tried to be innovative whenever possible to complete the project on schedule," Tanking said. Measures also were initiated to ensure that all the bridge pieces fit at the factories prior to being shipped to the job site. "There are sections with super elevation and cross slopes that rotate," said Tanking. "This was an extra effort to make sure connections were going to work out and stay on schedule." The demolition of the old bridge began in January and was completed in May. The first phase had all the concrete and easily removable pieces taken. The second phase had crews employ cut charges to split the girders and, as an alternative to standard demotion, allowed the steel superstructure to implode and fall into the river. The salvage operations removed nearly every piece of steel from the riverbed. "This kind of demolition is fairly common for us," said Tanking. "We were able to clean up the area rapidly." Substructure work also began in June, which has barges being employed to help with the pier installation. "It is moving along pretty well," said Tanking. "All of the footings outside of the river span are in place, with several spans of girders placed and decking beginning at the east end." 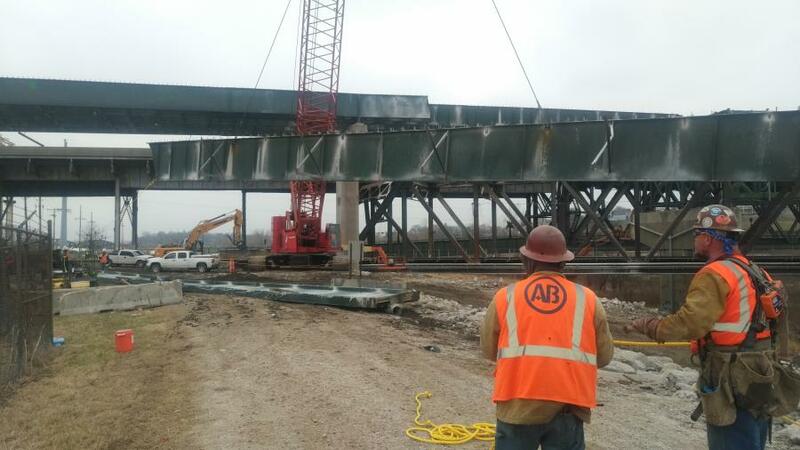 Peak days will see more than 40 American Bridge and subcontractor employees on site. Major subcontractors include Comanche Construction Inc. for existing structure repair, Greg Bair Track Hoe Services for demolition, Three Feathers Construction for tying resteel, Traffic Zone Services for traffic control, Hayes Drilling for drilled shafts, Mark One Electric Co. Inc. for ITS and lighting and Collins & Hermann for signing and fencing. In demolishing the old bridge, crews removed sizeable amounts of concrete, steel and asphalt. New materials to be brought in include more than 21,000 cu. yds. of concrete, 305 tons of asphalt and close to 3.1 million lbs. of reinforcing steel. This amount does not include the materials for the drilled shafts and the steel that has been added to the prestressed concrete beams that are being installed. The bridge's foundation will consist of 55,000 plus ft. of steel pile and close to 2,100 ft. of 72-in.-diameter drilled shafts. "Recycling materials is a benefit for us and the contractor," said Tanking. "We take our role of stewards of the state seriously. The successful completion of the project is crucial to KDOT. "We put seven years into it," said Tanking, "and we want to deliver a quality product to the community. This has also been a learning experience for many of our people. We have new engineers on-site to benefit from observing construction work."